Intel Viiv technology is new revolution on the entertainment PC by bringing you movies, music, games and photos in the comfort of your living room. 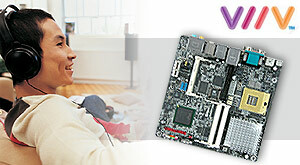 The i945GTt-VFA from AOpen Inc. is designed to support Intel Viiv technology. You can setup a HTPC (Home Theater PC) with it easily. AOpen i945GTt-VFA supports 667MHz FSB Intel Core Duo/Core Solo Socket 479 CPU. Intel Core Duo/Core Solo is the new generation processor providing the perfect combination between high dual-core computing performance and low power consumption. This architecture is ideal for building thin and light machine that requires great computing power and efficient thermal solution such as notebooks. 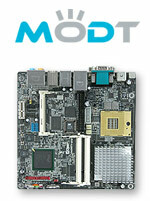 By AOpen MoDT (Mobile on Desktop) technology, you can take the advantage of mobile CPU with expend abilities of desktop system and have the coolest and quietest working environment for home media center. For the best visual result, Digital Visual Interface (DVI) technology was developed to enable high-resolution applications to be run on digital flat-panel displays. This specialized usage calls for cabling that can offer high bandwidth, as well as provide excellent EMI/RFI interference reduction. AOpen i945GTt-VFA built in DVI and S-Video ports for digital and analog video single output makes sure that you can get the best image quality on your display. HTPC must emphasis on both video and audio, more speakers will make real environmental surrounding sound. The i945GTt-VFA adopts Azalia 7.1 channel codec on-board, giving you the clear and purl multi channel output to reproduction realistic hearing experience. 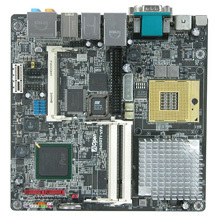 AOpen i945GTt-VFA is Flex ATX (mini ITX) form factor sizing 6.7” x 6.7” (17cm x 17cm), which is small enough for setup a compact system to preserve the space. You don’t have to clean up much room for it and even hide it to remain the decoration.